tall-ish, once really slim...now...not quite so much! Camper 50+years,...not quite a 'Glamper' , but admit to wanting to feel somewhat comfortable...i.e. .cutting brush to make myself some shelter is NOT my thing! Owning a RoadTrek longtime dream finally realized last year, and am committed to 'getting my $$$ out of her' as long as I am able. (before the constabulary get wise and pull my licence for speeding. Not likely to be an issue with my RoadTrek, b/c of her age.) 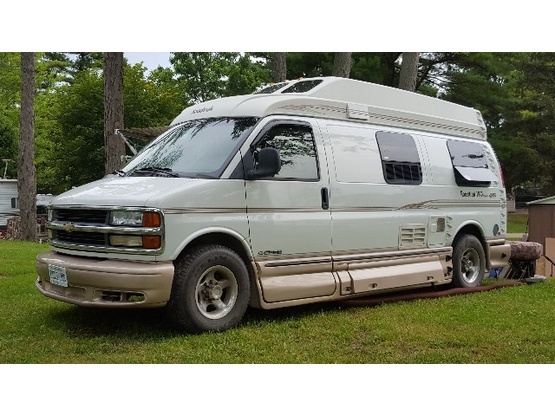 By self-admission, not mechanically savvy...will be open to advice/suggestions from other RoadTrek owners. -'Once a nurse, always a nurse" happy to give rudimentary advice within my realm of "ancient' expertise. -Not mechanically inclined admittedly, but willing to jimmy-rig/tackle anything not physically impossible, with what's at hand. Yep...will always be a lover of Irish Setters, am currently fortunate to share the companionship with my 6th, a 14 yr old female. I DO bring her camping with us, but won't subject her to the cramped quarters of the RT for extended road tours. Have two Red Factor canaries......likewise staying at home whilst I travel AND 3 dumb goldfish that weren't supposed to survive more than a month, but are too DUMB to do the right thing. Just signed up for Boondockers, so will add this as experience grows. Born and raised in Sudbury, Northern Ontario; fairly recently re-located to Stratford, Southern Ontario upon placing my dear husband in the safety of secure care/memory loss care closer to our sons.. A necessary move, although traumatic, it has been good to re-connect consistently with family in this area. The Country Cousins were great guests who respected our privacy but were ready to chat when we had time! They were fun to chat with about previous travels. Good stories. They are welcome back anytime. Two very friendly and organized cousins. Didn’t have a chance to chat with them to long. You’re welcome here anytime. Happy and safe travels. Hope you have the chance to greet these two LADIES, (could we call them) at home. They are very nice and it was a real pleasure to chat with them about different topics. They are very respectful of places and if it was not to see their vehicle in the parking lot, you might think that there was no one in your home ! Welcome any time "Countrycousins".